Forms are the main building blocks of the applications you build in App Builder. 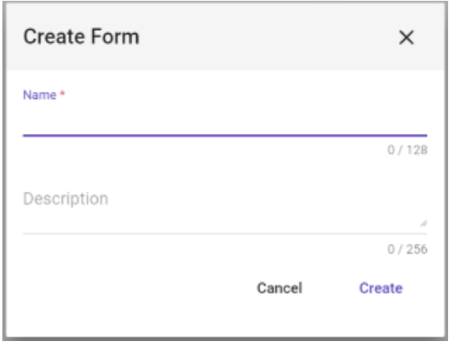 Just like with paper forms in your office, App Builder forms help users enter the correct information and display it in a structured and well defined way. Users create and edit the application’s data via forms. An App Designer can access the Forms Dashboard, where they can create and edit App Builder forms, by clicking on the Forms button from the left side navigator. 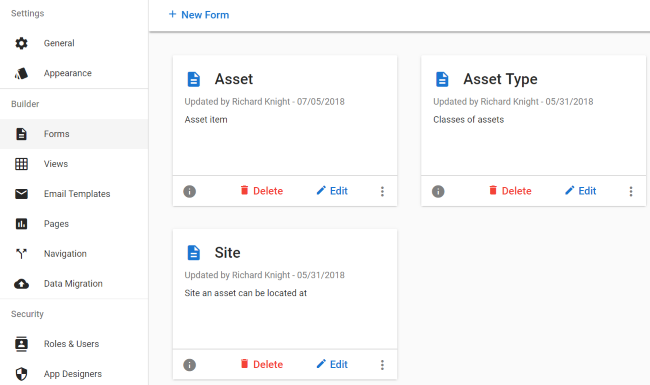 The Forms Dashboard shows all available forms for the current application, displayed as tiles. An App Designer can create and update them from here. Double clicking on a form’s tile will open the form in the Form Editor. Info Panel – Displays the right side information panel, with summary information about the currently selected form. Delete – Deletes the form from the application. Name Enter the name of the new form.